While we don't want kids following a life of crime there is something captivating about the story of Ned Kelly. He is a figure who has become larger than life in our history. Was he simply a culprit or was he wronged? Simply a murdering criminal or an Irish revolutionary? These school holidays there is a free event at the State Library where kids can see Ned Kelly's actual armour (which was formed from plough shields) and hear his story, then make a replica of his famous helmet. 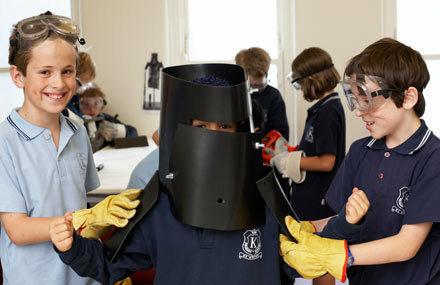 The 'letterbox'-style headpiece has become an Australian icon and features in the works of such important artists as Sidney Nolan and Albert Tucker. Not only did the masks and suits help protect Ned and his gang from close range shooting, they also made the bushrangers seem even more sinister and threatening which was an advantage during the Glenrowan siege. After Ned was captured, the police officers kept parts of the suits as souvenirs. But after years of research to locate and verify the various pieces, Ned Kelly's complete armour is now in the Library's collection. It may come as a surprise bu the State Library doesn't just have millions of books. It has an important collection of ephemera, art and objects. Arouses awe even in kids. Amongst these are Kelly's death mask and his original Jerilderie Letter. This letter was an 8000-word manifesto in which Ned justified his crimes and stating that he and his family were unfairly persecuted by the police. Even his mother did three years in jail on what some say were trumped up charges. 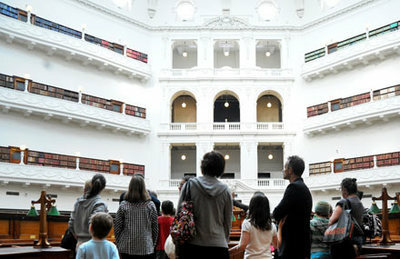 This school holiday program is a chance to learn a bit of history, see the stately State Library and to do this fun activity. It is recommended for children aged five to 12 years. The State Library has wheelchair access. Why? It's free fund and educational.